The Canadian singer was in poll position by Wednesday for his team effort on Blurred Lines with Pharrell Williams and TI to hit the top spot. Robin was outselling nearest rival, Naughty Boy with La La La, by two copies to one. Daft Punk was at number three mid-week with Get Lucky, while Jessie J came in at four with her new single Wild, featuring Big Sean and Dizzee Rascal. 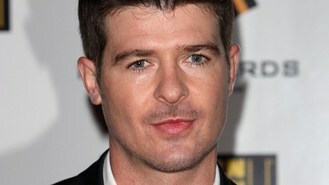 Singer Robin has topped the singles charts with Blurred Lines in his native Canada, as well as Australia, Ireland, the Netherlands and New Zealand. His previous highest UK chart position was number 11 back in 2007 with Lost Without U.